SIP-trunk is optimally for VoIP telephone systems. We handle the telephone calls via the NGN (next generation network): secure, with high speed and in the best voice quality. Whether you want to terminate your existing ISDN connection, replace it, or use UCC solutions, such as Skype for Business, you can use sip-trunk to connect your systems to the telephone network. 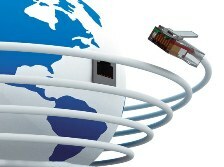 The future of telecommunications is IP. Replace your ISDN connection with a powerful SIP-trunk from TENIOS. You connect your existing telephone system to the telephone network via a broadband connection. TENIOS offers the best voice quality and at unbeatable prices from 0,01 € without fixed costs. We handle the telephone calls via the NGN (next generation network): secure, with high speed and in the best voice quality. Whether you want to terminate your existing ISDN connection, replace it, or use UCC solutions, such as Skype for Business, you can use SIP trunking to connect your systems to the telephone network. The simple connection allows you to integrate additional sites at any time and expand your capacity as desired. Your existing telephone system is connected to the telephone network (NGN) of TENIOS via your existing internet connection. The incoming and outgoing calls are made directly by IP, similar to an ISDN or PMX connection. For a good voice quality, you should ensure sufficient bandwidth with your internet provider. We expect a guideline of approx. 100 kb / s per simultaneous connection. 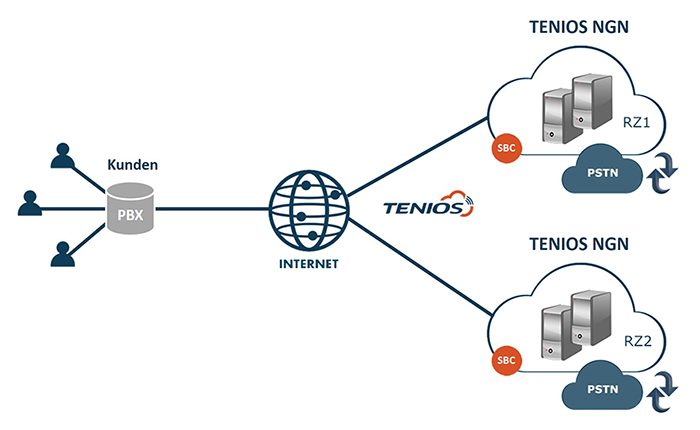 The SIP trunk is set up via the TENIOS Cloud Communication platform. You set up each trunk with the IP address, numbers and user name / password. This data is also transferred to your telephone system. The TENIOS system shows you the status of the connection and you can start immediately. SIP telefony replaces and complements conventional business telephony with analog or ISDN connections. In future you will not need your own telephone system or cost-intensive network technology. A conventional broadband Internet connection is sufficient. TENIOS offers telephone numbers in 5200 cities and 50.000 worldwide for 5,00 € per month. These numbers are connected to your SIP trunk. Your telephone system will forward the calls internally. In addition, you can set up further target points such as call centers, announcements or SIP trunks via our platform. When busy or inaccessible, calls are routed to these destinations. Change your number to : you do not need any new numbers, you can take your existing numbers with you. These numbers of eg Telekom, vodafone, versatel are ported to TENIOS. As a user, you are the owner of the phone number. Porting is performed without interruption or service failure. TENIOS provides geographic / virtual numbers in more than 100 countries worldwide. SIP trunking is the provision of a telephone service through a broadband Internet connection. The calls between the telephony provider (e.g. ) and the telephone system are transmitted by VoIP (SIP telephony). The conventional ISDN or PMX connection is no longer necessary. The network operators such as Deutsche Telekom, BT, SwissCom etc. have already announced the end of traditional ISDN or PMX connections for 2018 and ask your subscribers to switch to SIP trunking. Network operators have already switched these network operators to IP telephony in your NGN (next generation network). From 2018, the network connection will only be done via IP. No physical connection is necessary for the SIP trunk to a telephony provider (for example ). The existing broadband Internet service is used for this purpose. The connection is thus via the public Internet. This provider ensures a high level of security and voice quality through direct access to Germany's internet-base DE-CIX. Unlike conventional ISDN or PMX connections, the calculation of channels and connections is not required. With a SIP trunk, you are flexible in dimensioning your telephony connections (incoming and outgoing). This prevents overcapacities and extra costs for unused lines. With the SIP trunk you can adjust your bandwidth to the telephony provider at any time. The bandwidth is dependent on your Internet access. For a single call you should expect 100 kb / s. (example: for 30 connections you need a 2 MB line). waive your VoIP-gateways – VoIP gateways that are additionally required for IP telephony are no longer required. All calls go IP-supported. In many cases, the quality of the call is improved because no conversion of analog and digital lines is necessary. use of state-of-the-art telephony systems – Current IP-pbx systems / unified communications solutions promote productivity, mobility and sales. They are much easier to connect to SIP trunks than to the traditional telephone network. more flexibility – In the case of a growing call volume, SIP trunks can often be added to new voice channels immediately. Classic telephone systems, on the other hand, support additional cables that are expensive to install only after an additional hardware upgrades. Adaptable voice channels - Instead of having to dial 2 or even 30 lines as for ISDN / T1, you can use SIP trunks to determine the exact number of channels you actually need. Expensive overcapacities can be avoided.